The CVA offers up to 5 copies of WWJET free of charge. After that, the 8-page pamphlets are only 12 cents each. 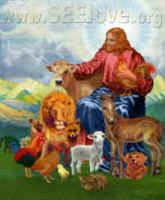 For more information about the CVA, visit http://www.christianveg.com/.